Darien Oceina is the youngest son of the Great Dragon Lord of the Water. For years he’s loved and cherished Tai Dawson from afar. Tai is a simple, ordinary girl who doesn’t even know Darien exists. On his eighteenth birthday, he chooses her as his wife. But there’s one problem: She thinks his choice means she’s going to be offered as a sacrifice to the Dragon Lord, but instead, she’s forced to move to his home, far away, to give up her life and be his bride. 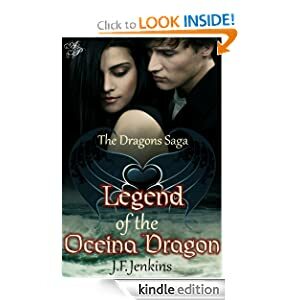 Legend of the Oceina Dragon is the first book in Ms Jenkins’ Dragons Saga. I love the fantasy world that Ms Jenkins has created for this series. She did a wonderful job of creating a dragon mythology that intertwines with the human world. There are 4 dragon types: Oceina (water), Inero (fire), Terran (earth), & Aero (wind). Each dragon type has its own strengths and weaknesses along with its own way of keeping their “secret”. You see, all dragons are born male and so they are able to change into human form and each must find a human woman to marry. This book follows the story of Darien and Tai’s relationship as they start out their marriage. I appreciated that the relationship has depth. Tai isn’t a girl who simply swoons over the gorgeous Darien and immediately falls in love. She was raised by a single mother (her father left when she was young) and she was never very social. Although she is grateful to be alive and not eaten by the dragon, she really struggles with finding herself in a marriage relationship far from home and isolated from her mother. While there isn’t a lot of character development with many of the secondary characters, I felt the main characters and the mythology were very well developed. I was drawn into the story right from the start and was kept engaged throughout the book. I really enjoyed learning about the dragons along with the developing relationship between Darien and Tai. When I finished the book, I immediately went in search of the next book. I was so pleased to find that there are four more books already out and additional free material on the author’s website. I highly recommend this series and eagerly await the conclusion of this series.